Making a dynamic Broadway debut as "Henrick Egerman" in A Little Night Music is Hunter Ryan Herdlicka. Hunter is a 2009 graduate of Carnegie Mellon in Pittsburgh. 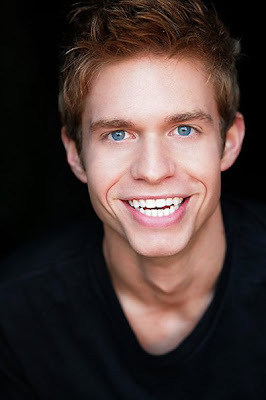 He studied musical theatre and earned his BFA in Drama. He began studying theatre in the first grade, after his grandparents took him to Dallas to see Cats, directed by none other than Sir Trevor Nunn, a fact that he has yet to share with him. He spent summers working at the Utah Shakespearean Festival and earned his equity card at the West Virgina Public Theatre. Not only is this his debut, but it was also the first audition he went on within his first week and half after he moved to New York. He was the first to be cast and it took all of about nine days. I recently met my new friend Hunter, a fellow Texan, at Bernadette's after party. Earlier tonight, we had dinner and chatted about this most momentous experience he is having in the very first Broadway revival of A Little Night Music. At the first preview, I walked in the theatre, and the first thing I saw was a single chair on stage and I thought what’s happening? And then the lights went up and you were there. I was just so thrilled. You were the very first one on stage on this first legendary night. Well, the first thing I did when I got to the theatre was, I wanted to see a playbill so bad. I was just dying to see what front of it looked like and when I opened it up and saw “In Order of Appearance - Henrick Egerman, Hunter Ryan Herdlicka” at the very the top, I was like ‘Wait a second, no, no , no, my name needs to be below Catherine, Angela, Alex, everybody, you made a mistake! And I walked on stage, and said ‘I’m so terrified.’ Then I said, ‘Absolutely not, I am so excited!’ Nerves and excitement are the same exact symptoms. And I have to tell myself every night that the nerves are sheer excitement. So when you’re at rehearsal, you’re getting notes from both Sondheim and Nunn? No, Sondheim didn’t come until the previews. So his notes came in previews. And what he gives is very minute things. The broadest notes he gives are about the tempos of songs. The smallest things he gives are word changes. For example, last night he changed a word in Later. And I’m thinking, ‘Oh my gosh, Sondheim just changed a word for me in Later and then asked if it was okay with me and then double-checked and then gave me the ultimate decision.’ And I was like, you know, for someone that fifteen years ago, ten years ago sat listening Sunday in the Park with George in their bedroom dreaming about Sondheim when I was just a kid, and then to have Sondheim next to me saying, ‘Do you think the word should be short or should it be bland? I think bland is better but if you want short, we’ll do short.’ And I thought, Oh my gosh, where am I?! And I sat at my note session yesterday, and directly next to me is Stephen Sondheim, directly in front of me is Catherine Zeta-Jones, standing is Sir Trevor Nunn, directly behind me is Angela Lansbury, and I’m like ‘Which one doesn’t belong here?’ It’s the biggest blessing. You have good chemistry with Ramona Mallory (who plays his young step-mother Anne Egerman). She is so silly! Is that all acting? She is so silly, but that is all acting. Ramona is quiet and reserved and one of my best friends. The second we saw each we just had so much chemistry. She is one of the greatest girls and so, so, so talented. But there is a clear distinction between her hysterical character Anne and Ramona in real life. She’s a gem. I’m so happy that she’s gotten the same opportunity as I have and is having the same experience as me. We’re both young. We’re both 23. We’re both making our debut. And she so deserves it. So you had to learn the cello for the top of the show. Did you know any musical instruments? No. None. I quit during my first piano lesson. And the cello is written in the bass clef and I I’m a tenor and don’t even read the bass clef. I have an incredible cello teacher. Mary Dorman, who is playing in the pit also, so she’s there with me every night. That’s me playing in the beginning but not in Later but the thing is that I’ve actually learned how to play all of it so if need to, I could. But what we ran into when we got into the theatre is about balancing me on stage with the band that is up, elevated stage right. So who knows maybe one of these days I’ll actually be playing those parts on stage. I’d love to, but we’ll see. Are you sharing a dressing room? I do, I share it with Aaron Lazar. He’s just amazing. He’s done 8 or 10 Broadway shows. And I look at him and I have so much to learn from him. He’s one of the most talented guys. In 10 years, I want to be where he is. I love every thing about him and I’ve gotten so close to him. I feel like he’ll always be in my life. I said I would come back sheerly for the story, those actors, the music itself, even if I’m disappointed with some things. But then I was reminded by some people who had never seen it before how much they loved it. Had you ever seen it before? I saw it in college at the music school, which was not affiliated with the drama school at Carnegie Melon. But I had been listening to cast albums probably since I was in sixth grade, so I knew the music. But a sixth grader can’t comprehend all of it. I don’t think I even got everything when I was a freshman in college. You know, it really is deep. And you have to have certain life experiences to really be able to relate to some of the things in the show. Which is so wonderful with Nunn’s idea of having every thing really cast close to what the ages of the characters should be. Henrick and Anne are not 30 years olds playing 19. Desiree is not 60 playing 40. I think it brings such energy, and such vibrancy and sensuality to the show. Catherine seems older than 40. She is very educated and very mature. And being around her, one, she’s the sweetest person on the face of the planet, but two, she just has this air of royalty about her. She has such presence. She just turned 40. And Nunn wanted someone who is 40 years old to play the role and that’s what he got. Nunn’s vision is he sees this as a chamber piece; a play, a Chekov play, with music. Sondheim’s initial vision was also minimalist – a guttural Chekovian, serious tone, and dark. At the end of the day, these men know more than anyone. Trevor and Sondheim both are just like walking encyclopedias, A to Z. They know everything about everything. I feel like Trevor could be my father. And he pushes me, he pushes me to the limit. He pushes me all the way, and then he’ll pull me back. And then he’ll push me more. And I’m thankful for that. When I’m sitting there getting notes, I’m sitting there thinking I must have screwed this up or that up, I walk off and I think, thank God that I have such a genius director looking out for me. Being my first Broadway show, there’s so much pressure. Being straight out of college, being chosen out of so many seasoned actors 30 years old and under. And another thing I had no idea how necessary previews were. I knew what an effect an audience has on our performance, but I didn’t know how many things are necessary, how previews are so necessary for the technical aspects for the show and for tweaking staging, choreography and figuring out where the laughs are . There were lines the first night, some of us, and thought we’d get uproarious moments of laughter and there was nothing, just crickets and now its, the audience is rolling over, side splitting. Wednesday night was our best performance. Did you read Riedel’s article today? I need to read it. Well, I can tell you that the lighting has been completely re-worked this week. New fog machines were installed yesterday, replacing the old broken machines that were already in the Walter Kerr. Is anybody in the cast giving you any advice? Yeah. You know, they’ve all done this before. Some have Academy Awards. Some have multiple Tonys. You know the best advice has been to not read reviews, to not read message boards, to not base everything off the audience’s reactions because some audiences are quieter than others and at the end, they stand up and love it more than louder audiences. Other is just listen to Sondheim and listen to Trevor and you stick by what they are saying and don’t get distracted. Trevor says, “You stick with me, you’ll be all right.” At the end of the day, he knows what works. You listen to him and you trust him and you know what he says is right. He doesn’t force anything on you. At the end of the day, you come back to what Trevor first told you. How is Angela? Does she say things to Sondheim or Nunn about her own ideas? Never. We all have ideas that we bring to the table. But we all listen to Stephen, we all listen to Trevor. And she is so open to them. Because she is such, she has just been around to know how the theatre works, that you listen to your director and you trust him and you try what he says. She is the most humble person. Humble, humble, humble. The first day we were all scared to sing for Stephen. And even she was. And she said, “Stephen don’t look at me. You make me nervous. And you’re thinking this is Angela Lansbury, but it’s nice to know that it’s a natural thing that you don’t have to hide. Just from being in her presence I’m learning things. Is your family coming to Opening Night? My family has all been - my mother has already seen it four times - and they are coming back next week, flying in from Dallas. I have tons of friends who are coming in from school and family flying up from home to see and that’s the best part is getting to see people that you haven’t seen in almost ten years. An incredible suit by Ted Baker, who is one of my favorite designers. It’s just a gorgeous Ted Baker suit. Believe it or not, I actually wear some Ted Baker in the show. I love that idea. I love Ted Baker. If anything could have happened, it seems this is meant to be. You were the first one chosen. Are you just feeling like you’re in a dream? Yeah! You know some days I walk in and it feels so natural be in a theatre, to walk on the stage and do a show, because I’ve been doing this since I was in the first grade. But every once in a while, it just really hits me hard. You know, it’s right before you walk on, or in the middle of the show when you’re listening to it in your dressing room, or at the curtain call, you know, I’m just like oh wait, this isn’t just like high school, or just college, or isn’t a regional theatre some where. This is it. This is the best. The BEST. Bravo! You're such a friend-maker, SarahB. And what a cutie he is—it's nice to see someone's hard work and lucky stars align and know they appreciate the magnitude of the moment. And I very much hope it all comes together the way they're envisioning it (okay, guarded, but hopeful, too). Fancy you! Interviewing Broadway stars. Lovely interview, SarahB! What an exceptional interview. It's making me all the more excited to see this revival on Broadway! Hunter is absolutely as nice in real life as he sounds in this interview. He's a great guy, and I'm so happy for him. Loved the interview.